Well, I got the Horseman HD45. It's a really cool camera, as someone said, reminiscent of the press cameras, very simple to open and use. It has no back controls but has sufficient front controls to do a lot of nature and landscape, and other photography, such as some portraits, some architecture, some studio, etc. But it's just an excellent learning camera. It's flaws? That's hard as it's a basic camera. It does have a narrow range of useable lenses, mostly the 110/120mm to 210/240mm range with some longer telephoto lenses and maybe wider angle lenses with a bag bellows. My only problem is the small lens board and bellows opening. It turned out my APO Symmar 180mm f5.6 lens won't fit as the rear group is too large for the opening and lens board. So I have to find a non-APO 150mm or 180mm lens with a small rear group. That's down the road. Right now the goal is getting comfortable with the camera, meaning the habit and process of setting up, lens, focusing, film handling, shutter operation, and the breath-holding exposing, the reality of the moment, light meet film. 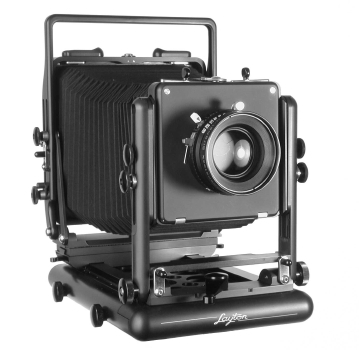 The other parts are the common composing, metering, shutter and aperture setting, to which you add the real large format advantages. And that is? It's why you get the camera in the first place. Complete image control with the camera movement and control. It's learning photography the old-fashioned way, with your heart and mind. And downsides? Or is that the upside down and backward issue? That's something you first go, "Huh? ", but with a composing card and viewing through the ground glass it becomes clear. Your brain translates it fairly well. Where am I now? Ok, The camera has been setup in the living room for now, remember it's Seattle and we're having a very wet winter. I've playing with the controls, working on the process to use it routinely in the field. The problem with the HD45 is that it doesn't have any levels, so you have to get them (flash shoe type) or just watch the ground glass, but that's a guess which could create problems when you begin to use the tilt, swing or tilt, when the planes aren't initially parallel. So, it's onward with the learning curve. And then as they say, "Try putting film in the camera, stupid."